Presentation history of Heart as Arena (stage presentation for 5 performers): Premiere at the Vancouver East Cultural Centre, Vancouver, October 4-8, 2011. Subsequent performances at the National Arts Centre, Ottawa, May 10-12, 2012; Festival TransAmériques, Agora de la danse, Montréal, May 29-31, 2012; the Centennial Theatre, Sherbrooke, April 23, 2013; La Rotonde/Salle Multi, Québec City, April 25-27, 2013. The stage version of Heart as Arena featured performers Sarah Doucet, Shay Kuebler, Amber Funk Barton, Masahuru Imazu, and Dana Gingras. Lighting by Mikko Hynninen, dramaturgy by Ruth Little and Daniel Canty, costumes and styling by Sarah Doucet. Heart as Arena was developed over a series of workshops with dancers and a radio installation of over 100 small pocket-sized radios suspended in the dance studio. Radios were triggered by dancers’ movements, dancers were propelled by the search for songs of love embedded in the static of the radiophonic landscape. We explored CPR, the electro-magnetic cycle of the heart as organ, and the landscape of waves. Eventually this fertile ground resulted in a full-length show for five dancers, with a suspended, tilted ‘arena’ of Crosley retro radios overhead, and a host of mid-century transistor radios on the floor manipulated by the dancers directly. Dana’s physically demanding choreography embodied these socio-technical relations of push and pull, desire, repulsion, and interference that we worked with in the studio. The piece was born from direct experiences of love, longing, discomfort and displacement; and from the paradoxes of intimacy, distance, and the desire to be communicate and be closer. The next iteration, Endless Love: All Transistor Model, is a second phase of development for this project, resulting in a smaller, more intimate version flexible enough to install in a variety of spaces outside of the conventional theatre setting, using 2 performers, vintage radios and a multi-channel micro-watt radio transmission system. The fundamental desire to connect, despite obstacles of time and distance, is a central paradigm of human communication. Heart as Arena: nocturne is a multimedia work for two performers which explores ideas of receptivity, transmission, and the invisible language of electricity that animates heart, mind, and muscle. In the dream of the digital future, radio, like love and imperfect bodies, was supposed to be left behind in favour of more transcendental versions of wirelessness. What we find is that there is no such thing as dead air: the radio landscape is alive though connections are fragile and prone to interference, urgently vibrating with activity, temporary and unstable. Two performers move through an installation of 30 mid-century vintage transistor radio receivers, with up to 50 additional pocket-sized radios suspended overhead. The performers turn the radios on and off, tuning across the nighttime landscape and the radio dial in search of songs of love. They dance together among the radios, they experience fitful dreams and nightmares, they seek resuscitation and connection. The mediated landscape is responsive to their bodies: two micro-watt FM transmitters narrowcast fragile streams of love songs, static, textures, heterodyne hums and signals, creating a physical soundscape that is constantly acted on and disrupted by the slipping frequencies and electrical interference between devices and the dancers’ moving bodies. Bodies serve as antennae, and receivers become transmitters. 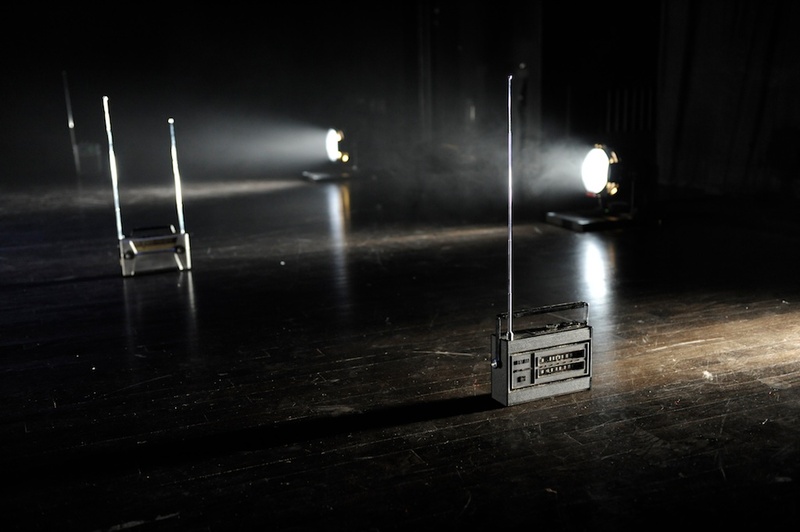 In this way, the radios act as the sound system, as the moveable scenography, and as colloborating performers, as the devices themselves produce unexpected sounds. The choreography explores the heart as an arena of electrical and emotional force fields; the attraction and repulsion of bodies in motion; physically demanding expressions of need and want; the electrical interplay at the base of human emotions; the firing and silencing of the very neurons that create the experience of falling in or out of love. The heart in crisis requires action, even if union is never realized. Radio becomes a frame for a series of relationships, near and far, where visible gestures meet invisible electro-magnetic interactions; a circuit built, played with, and played within. For Endless Love: All Transistor Model, our preferred format is a 5-6 hour endurance installation which includes multi-channel radio transmission and three live performers (2 dancers and a sound artist). The installation has three modes defined by a particular arrangement of the radios on the floor of the space, a particular sonic environment, and structured though improvised choreography. The three modes include a city at night (a gathering of radios to form an urban cityscape, emitting chirps and insectoid sounds transduced from satellite signals and electro-magnetic activity in the Earth’s ionosphere), a series of avenues (in which the radios are placed in lines with space in between for dancers to move and ‘play’ the open signals of the radios like theremins), and a dance marathon (in which the dancers partner to a time-stretched version of the popular song “Endless Love”). These three modes repeat once an hour for the duration of the performance. Endless Love: All Transistor Model was presented in June 2015 at Stable, Montréal during the 24-hour art event Endless Love. Further documentation here. The work returns to the feeling of intimacy that was present during the developmental work for Heart as Arena in Dana Gingras’ Montréal studio, so I include some early promotional video below from that process. Heart As Arena from Dana Gingras on Vimeo. Heart as Arena is a co-production of the CanDance Network Creation Fund, The Cultch, Brian Webb Dance Company, National Arts Centre, Agora de la danse, and supported by the Dance Section of the Canada Council for the Arts. Heart as Arena is also a co-production of Festival TransAmériques.